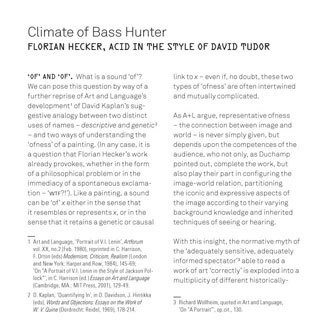 'Acid In The Style Of David Tudor' is Florian Hecker's first full length studio (as opposed to collections and commissions for art installations) album since 2003 when the groundbreaking 'Sun Pandamonium' was unleashed by Mego. Since then he has collaborated on audio projects with Yasunoa Tone, Russell Haswell (as Hecker and Haswell) and most recently in a live setting with the Aphex Twin as well as a myriad of sound Installation works, individually and with numerous artists worldwide. Florian is widely recognised as one of the most forward thinking operators working within the boundaries of contemporary computer music and is a firm favourite among the braver ears in the boomkat office, with this album quite simply ranking as one of the most bracing and shocking auditory experiences we've ever had the pleasure of taunting our neighbours with. A total shock to anyone's system that will doubtless leave even the best trained ears gasping at the 3D sculpted sound design and baffling non-linear dynamics. As the title suggests, this album is referencing the parallel universes of modern 20th Century composition and hedonistic rave culture with an exploded display of discplined avant garde ideas, methods and processes applied with a mindblowing dynamism. The set is conceptually divided into three areas linked to their sources of manipulation, the six 'Acid In The style of...' tracks, using a Buchla modular synthesizer in combination with a Comdyna analog computer, three 'ASA' pieces derived from a complex electro-acoustic process and the closing 'Ten', but to all but the most academic of listeners this really bears no significance on your listening experience. Listening to the album is a process of utter immersion into an unfathomably complex arrangement of purest electronic sound, bucking with a vital unpredictability between the most extreme peripheries of the sonic imagination and ultimately delivering the sort of rewards you simply can't find anywhere else. We must stress the importance of listening to this album as loud as you can manage through the best amplifier and speakers you can find, it's only when the sounds are released into your selected listening space that you begin to fully appreciate the breadth, depth and scope of Hecker's intense dynamism, allowing yourself to be completely surrounded by combinations of sound processed in such an alien and unnatural manner that you find yourself actively reprogramming your own mind in real time to catch up. It's an amazing example of rigorous academic thought that could only be understood by few, translating into a stunning psychedelic experience that can be felt (or confused) by anyone brave enough to approach it. The most rewarding track on offer is the closer 'Ten', where virtual binaural, stereophonic, biphonic and monaural sound reproduction coexist to display contrasting dynamics where non-linear waveforms and psychoacoustic illusions push our perceptual and representational fabrics. Or for you and me, it's a priviliged peek into an alternate 3D sound universe making you feel something like the guys in Tron. 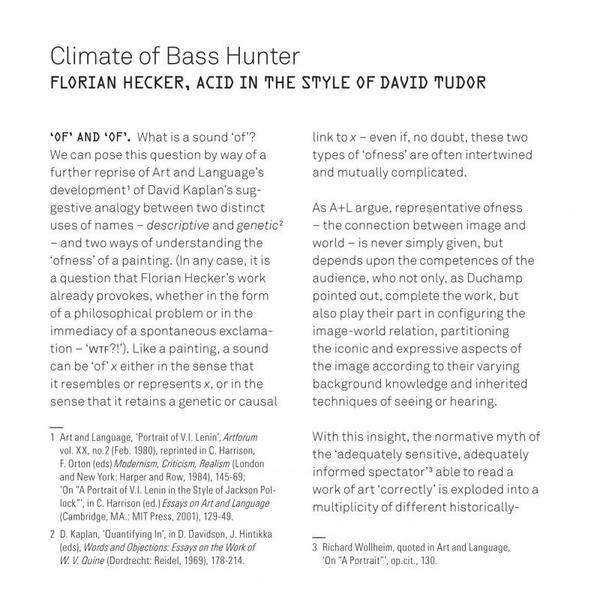 The release is accompanied by an extensive 16 page essay 'Cliamte Of A Bass Hunter: Florian Hecker Acid In The Style Of David Tudor' by Robin Mackay which relates the album to the ideas of philosopher David Kaplan. One of the most overwhelming and life affirming listening experiences ever? We think so.